The city of Paris has notable examples of architecture of every period from the Middle Ages to the 21st century. It was the birthplace of the Gothic style, and has important monuments of the French Renaissance, the Classical revival, and flamboyant style of the reign of Napoleon III; the Belle Époque, and the Art Nouveau style. The great Paris Universal Expositions of 1889 and 1900 added Paris landmarks, including the Eiffel Tower and Grand Palais. In the 20th century, the Art Deco style of architecture first appeared in Paris, and Paris architects also influenced the postmodern architecture of the second half of the century. The Roman town had three large baths near the forum, supplied with water by a 46-kilometer-long aqueduct. Vestiges of one bath, the Thermes de Cluny, can still be seen on Boulevard Saint-Michel. It was the largest of the three baths, one hundred meters by sixty-five meters, and was built at the end of the 2nd century or beginning of the 3rd century BC, at the height of the town's grandeur. The baths are now part of the Musée national du Moyen Âge, or National Museum of the Middle Ages. Nearby, on rue Monge, are the vestiges of the Roman amphitheater, called the Arènes de Lutèce, which was discovered and restored in the 19th century. Though the population of the town was probably no more than 5–6 thousand persons, the amphitheater measured 130 meters by 100 meters, and could seat fifteen thousand persons. Fifteen tiers of seats remain from the original thirty-five. It was built in the 1st century AD and was used for the combat of gladiators and animals, and also for theatrical performances. Unlike the south of France, Paris has very few examples of Romanesque architecture; most churches and other buildings in that style were rebuilt in the Gothic style. The most remarkable example of Romanesque architecture in Paris is the church of the Abbey of Saint-Germain-des-Prés, built between 990 and 1160 during the reign of Robert the Pious. An earlier church had been destroyed by the Vikings in the 9th century. The oldest elements of the original church existing today are the tower (the belfry at the top was added in the 12th century), and the chapel of Saint Symphorien, on the south flank of the bell tower, built in the 11th century. It is considered the earliest existing place of worship in Paris. The gothic choir, with its flying buttresses, was added in the mid-12th century, it was consecrated by Pope Alexander III, in 1163. It was one of the earliest gothic style elements to appear in a Paris church. The original towers of the Palais de la Cité; the Tour Bonbec (1226–70), far right, is the oldest; the Cesar Tower and Silver Tower (center) and Horloge Tower (left) were built in the 14th century. The first clock was installed on the tower of the Horloge in 1370. The current clock is modern. The Gothic Style went through another phase between 1400 and about 1550; the Flamboyant Gothic, which combined extremely refined forms and rich decoration. The style was used not only in churches, but also in some noble residences. Notable existing examples are the Church of Saint-Séverin (1489–95) with its famous twisting pillar; the elegant choir of the church of St-Gervais-et-St-Protais,; the Tour Saint-Jacques, the flamboyant Gothic vestige of an abbey church destroyed during the Revolution; and the chapel of the residence of the Abbots of Cluny, now the Museum of the Middle Ages, and the ceiling of the Tour Saint-Jean-Sans-Peur, a vestige of the former residence of the Dukes of Burgundy, in the 2nd arrondissement. The house of Nicolas Flamel (1407), considered the oldest house in Paris, was actually a kind of hostel. 17th-century engraving of the Hotel de Ville, built 1533–1628, burned 1871, restored 1882. The Lescot wing of the Louvre, rebuilt by François I beginning in 1546 in the new French Renaissance style. The Fontaine des Innocents (1549), next to the city market, celebrated the official entrance of king Henry II into Paris, by Pierre Lescot and Jean Goujon. The first structure in Paris in the new style was the old Pont Notre-Dame (1507–12), designed by the Italian architect Fra Giocondo. It was lined with 68 artfully designed houses, the first example of Renaissance urbanism. King Francis I commissioned the next project; a new Hôtel de Ville, or city hall, for the city. It was designed by another Italian, Domenico da Cortona, and begun in 1532 but not finished until 1628. The building was burned in 1871 by the Paris Commune, but the central portion was faithfully reconstructed in 1882. A monumental fountain in the Italian style, the Fontaine des Innocents, was built in 1549 as a tribune for the welcome of the new King, Henry II, to the city on June 16, 1549. It was designed by Pierre Lescot with sculpture by Jean Goujon, and is the oldest existing fountain in Paris. The first Renaissance Palace built in Paris was the Château de Madrid; it was a large hunting lodge designed by Philibert Delorme and erected between 1528 and 1552 west of the city in what is now the Bois de Boulogne. It was combination of both French and Italian Renaissance styles, with a high French-style roof and Italian loggias. It was demolished beginning in 1787, but a fragment can still be seen today in the Trocadero Gardens in the 16th arrondissement. Under Henry II and his successors, the Louvre was gradually transformed from a medieval fortress into a Renaissance palace. The architect Pierre Lescot and sculptor Jean Gouchon made the Lescot wing of the Louvre, a masterpiece of combined French and Italian Renaissance art and architecture, on the southeast side of the Cour Carrée of the Louvre (1546–53). Inside the Louvre, they made the staircase of Henry II (1546–53) and the Salle des Cariatides (1550). Both French and Italian elements were combined; the antique orders and paired columns of the Italian renaissance were combined with sculpted medallions and high roofs broken by windows (later known as the Mansard roof), which were characteristic of the French style. Most of the churches built in Paris in the 16th century are in the traditional flamboyant gothic style, though some have features borrowed from the Italian Renaissance. The most important Paris church of the Renaissance is Saint-Eustache, 105 meters long, 44 meters wide and 35 meters high, which in size and grandeur, approaches that of the Cathedral of Notre-Dame. King Francis I wanted a monument as the centerpiece for the neighborhood of Les Halles, where the main city market was located. The church was designed by the King's favorite architect, Domenico da Cortona, The project was begun in 1519, and construction began in 1532. The pillars were inspired by the monastery church of Cluny, and the soaring interior is taken from the gothic cathedrals of the 13th century, but Cortona added details and ornament taken from the Italian Renaissance. It was not completed until 1640. The other churches of the period follow the more traditional flamboyant gothic models. They include Saint-Merri (1520–52), with a plan similar to Notre-Dame; Saint-Germain l'Auxerrois, which features impressive flying buttresses; and the Église Saint-Medard. whose choir was built in beginning in 1550; St-Gervais-et-St-Protais features a soaring gothic vault in the apse, but also had a transept a more sober classical style inspired by the Renaissance. (The baroque façade was added in the 17th century).in the Saint-Étienne-du-Mont (1510–86), near the modern Pantheon on Mont Sainte-Genevieve, has the only remaining Renaissance rood screen (1530–35), a magnificent bridge across the center of the church. The flamboyant gothic church of Saint-Nicholas-des-Champs (1559) has a striking Renaissance feature; a portal on right side inspired by designs of Philibert Delorme for the former royal residence, the Palace of Tournelles in the Marais. The ordinary Paris house of the Renaissance was little changed from the medieval house; they were four to five stories high, narrow, built on a stone foundation of wood covered with plaster. They usually had a pigeon, or gabled roof. The two houses at 13-15 rue François Miron (actually built in the 16th or 17th century, but often described as medieval houses) are good examples of the Renaissance house. Once the French court returned to Paris from the Loire Valley, the nobility and wealthy merchants began to build hôtels particuliers, or large private residences, mostly in the Marais. They were built of stone and richly decorated with sculpture. They were usually built around a courtyard, and separated from the street. The residence was a located between the courtyard and garden. The façade facing the courtyard had the most sculptural decoration; the façade facing the garden was usually rough stone. The Hôtel Carnavalet at 23 rue de Sévigné, (1547–49), designed by Pierre Lescot, and decorated with sculpture by Jean Goujon, is the best example of a Renaissance h As the century advanced, the exterior stairways disappeared and the façades became more classical and regular. A good example of the later style is the Hôtel d'Angoulême Lamoignon, at 24 rue Pavée in the 3rd arrondissement (1585–89), designed by Thibaut Métezeau. The architectural style of the French Renaissance continued to dominate in Paris through the Regency of Marie de' Medici. The end of the wars of religion allowed the continuation of several building projects, such as the expansion of the Louvre, begun in the 16th century but abandoned because of the war. With the arrival in power Louis XIII and the ministers Richelleu and Mazarin, a new architectural style, the baroque, imported from Italy, began to appear in Paris. Its purpose, like Baroque music and painting, was to awe Parisians with its majesty and ornament, in opposition to the austere style of the Protestant Reformation. The new style in Paris was characterized by opulence, irregularity, and an abundance of decoration. The straight geometric lines of the buildings were covered with curved or triangular frontons, niches with statues or cariatides, cartouches, garlands of drapery, and cascades of fruit carved from stone. Louis XIV distrusted the unruly Parisians, and spent as little time as possible in Paris, finally moving his Court to Versailles in, but at the same time he wanted to transform Paris into "The New Rome", a city worthy of the Sun King. Over the course of his long reign, from 1643 until 1715, the architectural style in Paris gradually changed from the exuberance of the baroque to a more solemn and formal classicism, the embodiment in stone of the King's vision of Paris as "the new Rome." The new Academy of Architecture, founded in 1671, imposed an official style, as the Academies of art and literature had earlier done. The style was modified again beginning in about 1690, as the government began to run short of money; new projects were less grandiose. In the 17th century, the first large-scale urban planning of Paris was initiated by royal ordinance, largely based on the model of Italian cities, including the construction of the first residential squares. The first two squares, Place Royale (now Place des Vosges, 1605–12) and Place Dauphine, the latter in place of the old royal garden on the Île-de-la-Cité, were both begun by Henry IV, who also completed the first Paris bridge without houses, the Pont Neuf (1599–1604). The Place Royale had nine large residences on each of its four sides, with identical façades. The Place Dauphine had forty houses on its three sides (of which just two remain today). Louis XIV continued the style with Place des Victoires (1684–97) and Place Vendôme (1699–1702). Both of these squares were (1) designed by Jules Hardouin-Mansart, (2) had statues of the King in the center, and (3) were financed largely by the sale of the houses around the squares. The residences around the latter two squares had identical classical façades and were built of stone, following Hardouin-Mansart's Grand Style used in his monumental buildings. The residential squares all had pedestrian arcades on the ground floors, and what became known as a mansart window breaking the line of the high roof. They set a model for European squares in the 18th century. Another element of the new architecture of Paris was the bridge. The Pont Neuf (1599–1604) and Pont Royal (1685–89), by engineer François Romain and architect Jules Hardouin-Mansart, were built without the rows of houses that occupied earlier bridges, and were designed to match the grand style of the architecture around them. After the assassination of Henry IV in 1610, his widow, Marie de' Medici, became the regent for the young Louis XIII and between 1615 and 1631 she built a residence for herself, the Luxembourg Palace, on the left bank. It was inspired by the palaces of her native Florence, but also by the innovations of the French Renaissance. The architect was Salomon de Brosse, followed by Marin de la Vallée and Jacques Lemercier. In the gardens, she built a magnificent fountain, the Medici Fountain, also on the Italian model. The construction of the Louvre was one of the major Paris architectural projects of the 17th century, and the palace architecture clearly showed the transition from the French Renaissance to the classical style of Louis XIV. Jacques Lemercier had built the Pavillon de l'Orloge in 1624–39 in an ornate baroque style. Between 1667 and 1678 Louis Le Vau, Charles Le Brun, François d'Orbay and Claude Perrault rebuilt the east exterior façade of the courtyard with a long colonnade. A competition was held in 1670 for the south façade, which included a proposal from the Italian architect Bernini. Louis XIV rejected Bernini's Italianate plan in favor of a classical design by Perrault, which had a flat roof concealed by a balustrade and a series of massive columns and triangular pediments designed to convey elegance and power. Louis Le Vau and Claude Perrault rebuilt the interior façade of the cour Carée of the Louvre in a more classical version than that of the facing Renaissance façade. The Louvre was gradually transformed from a Renaissance and baroque palace to the classical grand style of Louis XIV. Church architecture in the 17th century was slow to change. Interiors of new parish churches, such as Saint-Sulpice, Saint-Louis-en-l'Île and Saint-Roch largely followed the traditional gothic floor-plan of Notre-Dame, though they did add façades and certain other decorative features from the Italian Baroque, and follow the advice of the Council of Trent to integrate themselves into the city's architecture, and they were aligned with the street. In 1675, an official survey on the state of church architecture in Paris made by architects Daniel Gittard and Libéral Bruant recommended that certain churches "so-called Gothic, without any good order, beauty or harmony" should be rebuilt "in the new style of our beautiful modern architecture", meaning the style imported from Italy, with certain French adaptations. The most dramatic new feature of Paris religious architecture in the 17th century was the dome, which was first imported from Italy in about 1630, and began to change the Paris skyline, which hitherto had been entirely dominated by church spires and bell towers. The domed churches began as a weapon of the Counter-Reformation against the architectural austerity of the Protestants. The prototype for the Paris domes was the Church of the Jesu, the Jesuit church in Rome, built in 1568–84 by Giacomo della Porta. A very modest dome was created in Paris between 1608 and 1619 in the chapel of the Louanges on rue Bonaparte. (Today it is part of the structure of the École des Beaux-Arts). The first large dome was on the church of Saint-Joseph des Carmes, which was finished in 1630. Modifications in the traditional religious services, strongly supported by the growing monastic orders in Paris, led to modification in church architecture, with more emphasis on the section in the center of the church, beneath the dome. The circle of clear glass windows of the lower part of the dome filled the church center with light. An elegant new form of domestic architecture, the rustic style, appeared in Paris in the wealthy Le Marais at the end of the 16th and beginning of the 17th century. This style of architecture was usually used for ornate apartments in wealthy areas, and for Hôtel Particuliers. It was sometimes called the "style of three crayons" because it used three colors; black slate tiles, red brick, and white stone. This architecture was expensive, having a variety of different materials, and ornate stone work. This style inspired the unique Palais de Versailles. The earliest existing examples are the house known as the Maison de Jacques Cœurat 40 rue des Archives (4th arr.) from the late 16th century; the Hôtel Scipion Sardini at 13 rue Scipion in the (5th arr,) from 1532, and the Abbot's residence at the Abbey of Saint-Germain-des-Prés at 3-5 rue de l'Abbaye, (6th arr. ), from 1586. The most famous examples around found around the Place des Vosges, built between 1605 and 1612. Other good examples are the Hospital of Saint-Louis on rue Buchat (10th arr.) from 1607 to 1611; the two houses at 1-6 Place Dauphine on the Île de la Cité, from 1607 to 1612; and the Hôtel d'Alméras at 30 rue des Francs-Bourgeois (4th arr. ), from 1612. After 1650 the architect François Mansart introduced a more classical and sober style to the hôtel particular. The Hôtel de Guénégaud des Brosses at 60 rue des Archives (3rd arrondissement) from 1653 had a greatly simplified and severe façade. Beginning in the 1660s Mansart remade the façades of the Hôtel Carnavalet, preserving some of the Renaissance decoration and a 16th portal but integrating them into a more classical composition, with columns, pediments and stone bossages. In the second part of the century, a more purely neoclassical style, based directly on Greek and Roman models, began to appear. It was strongly influenced by a visit to Rome in 1750 by the architect Jacques-Germain Soufflot and the future Marquis de Marigny, the director of buildings for King Louis XV. They and other architects who made the obligatory trip to Italy brought back classical ideas and drawings which defined Paris architecture until the 1830s. Soufflot's Roman trip led to the design of the new church of Saint Genevieve, now the Panthéon, the model of the neoclassical style, constructed on the summit of Mont Geneviéve between 1764 and 1790. It was not completed until the French Revolution, at which time it became a mausoleum for Revolutionary heroes. Other royal commissions in the new style included the royal mint, the Hotel des Monnaies on the Quai de Conti (6th arr. ), with a 117-meter-long façade along the Seine, dominated by its massive central Avant-corps and vestibule decorated with doric columns and caisson ceilings (1767–75). A large church with a dome, similar to Les Invalides, had been planned for the Place de la Madeleine beginning in the 1760s. the King laid the cornerstone on April 3, 1763, but work halted in 1764. The architect, Pierre Contant d'Ivry, died in 1777, and was replaced by his pupil Guillaume-Martin Couture, who decided instead to base his church on the Roman Pantheon; a classic colonnade topped by a massive dome. At the start of the Revolution of 1789, however, only the foundations and the grand portico had been finished. The later part of the 18th century saw the development of new residential blocks, particularly on the left bank at Odéon and Saint-Germain, and on the right bank in the first and second arrondissements. The most fashionable neighborhoods moved from the Marais toward the west. with large residential buildings constructed in a simplified and harmonious neoclassical style. The ground floors were often occupied by arcades to give pedestrians shelter from the rain and the traffic in the streets. Strict new building regulations were put into place in 1783 and 1784, which regulated the height of new buildings in relation to the width of the street, regulating the line of the cornice, the number of stories and the slope of the roofs. Under a 1784 decree of the Parlement of Paris, the height of most new buildings was limited to 54 pieds or 17.54 meters, with the height of the attic depending upon the width of the building. Paris in the 18th century had many beautiful buildings, but it was not a beautiful city. The philosopher Jean-Jacques Rousseau described his disappointment when he first arrived in Paris in 1731: I expected a city as beautiful as it was grand, of an imposing appearance, where you saw only superb streets, and palaces of marble and gold. Instead, when I entered by the Faubourg Saint-Marceau, I saw only narrow, dirty and foul-smelling streets, and villainous black houses, with an air of unhealthiness; beggars, poverty; wagons-drivers, menders of old garments; and vendors of tea and old hats." In 1749, in Embellissements de Paris, Voltaire wrote: "We blush with shame to see the public markets, set up in narrow streets, displaying their filth, spreading infection, and causing continual disorders… Immense neighbourhoods need public places. The center of the city is dark, cramped, hideous, something from the time of the most shameful barbarism." The uniform neoclassical style all around the city was not welcomed by everyone. Just before the Revolution the journalist Louis-Sébastien Mercier wrote: "How monotonous is the genius of our architects! How they live on copies, on eternal repetition! They don't know how to make the smallest building without columns… They all more or less resemble temples." Even functional buildings were built in the neoclassical style; the grain market (now the Chamber of Commerce) was given a neoclassical dome (1763–69) by Nicolas Le Camus de Mézières. Between 1785 and 1787, the royal government built a new wall around the edges of the city (The Wall of the Ferme générale) to prevent smuggling of goods into the city. it had fifty-five barriers, many of them in the form of Doric temples, designed by Claude Nicolas Ledoux. A few still exist, notably at Parc Monceau. The wall was highly unpopular and was an important factor in turning opinion against Louis XVI, and provoking the French Revolution. I have no doubt that Bouchardon will make of this fountain a fine piece of architecture; but what kind of fountain has only two faucets where the water porters will come to fill their buckets? This isn't the way fountains are built in Rome to beautify the city. We need to lift ourselves out of taste that is gross and shabby. Fountains should be built in public places, and viewed from all the gates. There isn't a single public place in the vast faubourg Saint-Germain; that makes my blood boil. Paris is like the statue of Nabuchodonosor, partly made of gold and partly made of muck. In 1806, in imitation of Ancient Rome, Napoléon ordered the construction of a series of monuments dedicated to the military glory of France. The first and largest was the Arc de Triomphe, built at the edge of the city at the Barrière d'Étoile, and not finished before July 1836. He ordered the building of the smaller Arc de Triomphe du Carrousel (1806–08), copied from the arch of Arch of Septimius Severus and Constantine in Rome, next to the Tuileries Palace. It was crowned with a team of bronze horses he took from the façade of St Mark's Basilica in Venice. His soldiers celebrated his victories with grand parades around the Carrousel. He also commissioned the building of the Vendôme Column (1806–10), copied from the Trajan's Column in Rome, made of the iron of cannon captured from the Russians and Austrians in 1805. At the end of the Rue de la Concorde (given again its former name of Rue Roya on 27 April 1814), he took the foundations of an unfinished church, the Église de la Madeleine, which had been started in 1763, and transformed it into the Temple de la Gloire, a military shrine to display the statues of France’s most famous generals. The Canal Saint-Martin was finished in 1822, and the building of the Bourse de Paris, or stock market, designed and begun by Alexandre-Théodore Brongniart from 1808 to 1813, was modified and completed by Éloi Labarre in 1826. New storehouses for grain near the Arsenal, new slaughterhouses, and new markets were finished. Three new suspension bridges were built over the Seine; the Pont d'Archeveché, the Pont des Invalides and footbridge of the Grève. All three were rebuilt later in the century. The church of La Madeleine, begun under Louis XVI, had been turned by Napoleon into the Temple of Glory (1807). It was now turned back to its original purpose, as the Royal church of La Madeleine. To commemorate the memory of Louis XVI and Marie Antoinette to expiate the crime of their execution, King Louis XVIII built the Chapelle expiatoire designed by Pierre-François-Léonard Fontaine in a neoclassical style similar to the Paris Pantheon.on the site of the small cemetery of the Madeleine, where their remains (now in the Basilica of Saint-Denis) had been hastily buried following their execution. It was completed and dedicated in 1826. The hôtel particular, or large private house of the Restoration, usually was built in a neoclassical style, based on Greek architecture or the style of Palladio, particularly in the new residential quarters of Nouvelle Athenes and the Square d'Orleans on Rue Taibout (9th arrondissement), a private residential square (1829–35) in the English neoclassical style designed by Edward Cresy. Residents of the square included George Sand and Frédéric Chopin. Some of the houses in the new quarters in the 8th arrondissement, particularly the quarter of François I, begun in 1822, were made in a more picturesque style, a combination of the Renaissance and classical style, called the Troubadour style. This marked the beginning of the movement away from uniform neoclassicism toward eclectic residential architecture. The first great architectural project of the reign of Louis-Philippe was the remaking of the Place de la Concorde into its modern form. The moats of the Tuileries were filled, two large fountains, one representing the maritime commerce and industry of France, the other the river commerce and great rivers of France, designed by Jacques Ignace Hittorff, were put in place, along with monumental sculptures representing the major cities of France. On 25 October 1836, a new centerpiece was put in place; a stone obelisk from Luxor, weighing two hundred fifty tons, brought on a specially built ship from Egypt, was slowly hoisted into place in the presence of Louis-Philippe and a huge crowd. In the same year, the Arc de Triomphe, begun in 1804 by Napoleon, was finally completed and dedicated. Following the return to Paris of the ashes of Napoleon from Saint Helena in 1840, they were placed with great ceremony in a tomb designed by Louis Visconti beneath the church of Les Invalides. Another Paris landmark, the column on the Place de la Bastille, was inaugurated on 28 July 1840, on the anniversary of the July Revolution, and dedicated to those killed during the uprising. Several older monuments were put to new purposes: the Élysée Palace was purchased by the French state and became an official residence, and under late governments the residence of the Presidents of the French Republic. The Basilica of Sainte-Geneviève, originally built as a church, then, during the Revolution, made into a mausoleum for great Frenchmen, then a church again during the Restoration, once again became the Panthéon, holding the tombs of great Frenchmen. The reign of Louis-Philippe saw the beginning of a movement to preserve and restore some of the earliest landmarks of Paris, inspired in large part by Victor Hugo's hugely successful novel The Hunchback of Notre-Dame (Notre-Dame de Paris), published in 1831. The leading figure of the restoration movement was Prosper Mérimée, named by Louis-Philippe as the inspector General of Historic Monuments. The Commission of Public Monument was created in 1837, and in 1842, Mérimée began compiling the first official list of classified historical monuments, now known as the Base Mérimée. The first structure to be restored was the nave of the church of Saint-Germain-des-Prés, the oldest in the city. Work also began in 1843 on the cathedral of Notre Dame, which had been badly damaged during the Revolution, and stripped of the statues on its façade. Much of the work was directed by the architect and historian Viollet-le-Duc who, sometimes, as he admitted, was guided by his own scholarship of the "spirit" of medieval architecture, rather strict historical accuracy. The other major restorations projects were Sainte-Chapelle and the Hôtel de Ville, dating to the 17th century; the old buildings which pressed up against the back of the Hôtel de Ville were cleared away; two new wings were added, the interiors were lavishly redecorated, and the ceilings and walls of the large ceremonial salons were painted with murals by Eugène Delacroix. Unfortunately, all the interiors were burned in 1871 by the Paris Commune. The first train stations in Paris were called embarcadéres (a term used for water traffic), and their location was a source of great contention, as each railroad line was owned by a different company, and each went in a different direction. The first embarcadére was built by the Péreire brothers for the line Paris-Saint-Germain-en-Laye, at the Place de l'Europe. It opened on 26 August 1837, and with its success was quickly replaced by a larger building on rue de Stockholm, and then an even larger structure, the beginning of the Gare Saint-Lazare, built between 1841 and 1843. It was the station for the trains to Saint-Germain-en-Laye, Versailles and Rouen. The avenue de l'Opéra painted by Camille Pissarro (1898). The grand stairway of the Paris Opera, designed by Charles Garnier, was begun in 1864 but not finished until 1875. The reading room of the Bibliothèque Nationale de France, site Richelieu (1854–75), was designed by Henri Labrouste with an iron frame and glass creating the effect of a cathedral. The dominant architectural style of the Second Empire was the eclectic, drawing liberally from the architecture of the Gothic style, Renaissance style, and style of Louis XV and Louis XVI. The best example was the Opéra Garnier, begun in 1862 but not finished until 1875. The architect was Charles Garnier (1825–1898), who won the competition against a Gothic-revival style by Viollet-le-Duc. When asked by the Empress Eugenie what the style of the building was called, he replied simply "Napoleon III." It was at the time the largest theater in the world, but much of the interior space was devoted to purely decorative spaces; grand stairways, huge foyers for promenading, and large private boxes. The façade was decorated with seventeen different materials, marble, stone, porphyry and bronze. Other notable examples of Second Empire public architecture include the Palais de Justice and the Court of Cassation by Joseph-Louis Duc (1862–68); the Tribunal de Commerce by Antoine-Nicolas Bailly (1860–65), and the Théâtre du Châtelet by Gabriel Davioud (1859–62) and Theater de la Ville, facing each other on Place du Châtelet. The Second Empire also saw the restoration of the famed stained glass windows and structure of Sainte-Chapelle by Eugène Viollet-le-Duc; and extensive restoration of Notre-Dame de Paris. Later critics complained that some of the restoration was more imaginative than precisely historical. Fontaine de la Paix, or Fontaine Saint-Michel by Gabriel Davioud (1856–61), where the new Boulevard Saint-Michel met the Seine. The map and look of Paris changed dramatically under Napoleon III and Baron Haussmann. Haussmann demolished the narrow streets and crumbling medieval houses in the center of the city (including the house where he was born) and replaced them with wide boulevards lined by large residential buildings, all of the same height (Twenty meters to the cornice, or five stories on boulevards and four on narrower streets), with façades in the same style, and faced with the same cream-colored stone. He completed the east-west axis of the city center, the Rue de Rivoli begun by Napoleon, built a new North-south axis, Boulevard de Sébastopol, and cut wide boulevards on both the right and left banks, including the Boulevard Saint-Germain, Boulevard Saint-Michel, usually culminating in a domed landmark. if a dome was not already there, Haussmann had one built, as he did with the Tribunal de Commerce and the Church of Saint-Augustin. To provide green space and recreation for the residents of the outer neighborhoods of the city, Haussmann built large new parks Bois de Boulogne, Bois de Vincennes, Parc Montsouris and Parc des Buttes Chaumont to the west, east, north and south, filled with picturesque garden follies, as well as numerous smaller parks and squares where the new boulevards met. City architect Gabriel Davioud devoted considerable attention to the details of the city infrastructure. Haussmann also built a new water supply and sewer system under the new boulevards, planted thousands of trees along the boulevards, and ornamented the parks and boulevards with kiosks, gateways, lodges and ornamental grills, all designed by Davioud. The Church of Saint Augustine (1860–71), by architect Victor Baltard, had a revolutionary iron frame but a classical Neo-Renaissance exterior. Religious architecture finally broke away from the neoclassical style which had dominated Paris church architecture since the 18th century. Neo-Gothic and other historical styles began to be built, particularly in the eight new arrondissements farther from the center added by Napoleon III in 1860. The first neo-Gothic church was the Basilica of Sainte-Clothilde, begun by Christian Gau in 1841, finished by Théodore Ballu in 1857. During the Second Empire, architects began to use metal frames combined with the Gothic style; the Eglise Saint-Laurent, a 15th-century church rebuilt in Neo-Gothic style by Simon-Claude-Constant Dufeux (1862–65), and Saint-Eugene-Sainte-Cecile by Louis-Auguste Boileau and Adrien-Louis Lusson (1854–55); and Saint-Jean-Baptiste de Belleville by Jean-Bapiste Lassus (1854–59). The largest new church built in Paris during the Second Empire was Church of Saint Augustine (1860–71), by Victor Baltard, the designer of the metal pavilions of the market of Les Halles. While the structure was supported by cast-iron columns, the façade was eclectic. The industrial revolution and economic expansion of Paris required much larger structures, particularly for railroad stations, which were considered the new ornamental gateways to the city. The new structures had iron skeletons, but they were concealed by Beaux-Arts façades. The Gare du Nord, by Jacques Ignace Hittorff (1842–65), had a glass roof with iron columns thirty-eight meters high, while the façade was in the beaux-arts style faced with stone and decorated with statues representing the cities served by the railway. The architecture of Paris created during the Belle Époque, between 1871 and the beginning of the First World War in 1914, was notable for its variety of different styles, from Beaux-Arts, neo-Byzantine and neo-Gothic to Art Nouveau, and Art Deco. It was also known for its lavish decoration and its imaginative use of both new and traditional materials, including iron, plate glass, colored tile and reinforced concrete. The Eiffel Tower was the gateway of the 1889 Paris Universal Exposition, and the tallest structure in the world when it was built. The new Gallery of Machines of the 1889 Exposition, again the largest building in the world, was decorated with colorful polychrome tiles. The fall of Napoleon III in 1871 and advent of the Third Republic was followed by the brief Paris rule of the Paris Commune (March–May 1871). In the final days of the Commune, as the French Army recaptured the city, the Communards pulled down the column in Place Vendôme and burned a number of Paris landmarks, including the 16th-century Tuileries Palace, the 17th-century Hôtel de Ville, the Ministry of Justice, the Cour des Comptes, the Conseil d'Etat, the Palais de la Légion d'Honneur, the Ministry of Finance, and others. The interior of the Tuileries Palace was completely destroyed, but the walls were still standing. Haussmann and others called for its restoration, but the new government decided it was a symbol of the monarchy and had the walls torn down. (A fragment of the building can be seen today in the Park of the Trocadero). Most of the others were restored to their original appearance. To celebrate the rebuilding of the city the Parisians hosted the first of three universal expositions which attracted millions of visitors to Paris, and transformed the architecture of the city. The Paris Universal Exposition of 1878 saw the building of the Palais du Trocadéro, an eclectic composition of Moorish, renaissance and other styles, on the hill of Chaillot by Gabriel Davioud and Jules Bourdais (1876–78), It was used in the Expositions of 1889 and 1900, and remained until 1937, when it was replaced by the Palais de Chaillot. The Paris Universal Exposition of 1889 celebrated the centenary of the French Revolution. The Eiffel Tower, (1887–89), conceived by entrepreneur Gustave Eiffel, and built by engineers Maurice Koechlin and Émile Nougier and architect Stephen Sauvestre, was the tallest structure in the world, was the gateway to the Exposition, and the Gallery of Machines, designed by Ferdinand Dufert and Victor Contamin, was the largest covered space in the world when it was built. It combined modern engineering with colorful polychrome decoration, typical of the Belle Epoque. The Grand Palais, by Henri Deglane], Charles Girault, Albert Louvet and Albert Thomas (1897–1900), had a Beaux-Arts façade concealing a vast exhibit hall. The interior of the Petit Palais, with a curving stairway built of reinforced concrete and iron. 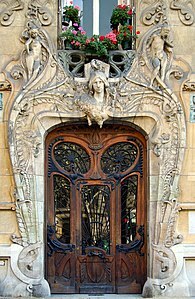 The Art Nouveau became the most famous style of the Belle Époque, particularly associated with the Paris Métro station entrances designed by Hector Guimard, and with a handful of other buildings, including Guimard's Castel Béranger (1898) at 14 rue La Fontaine, in the 16th arrondissement, and the ceramic-sculpture covered house by architect Jules Lavirotte at 29 Avenue Rapp (7th arrondissement). The enthusiasm for Art Nouveau did not last long; in 1904 the Guimard Metro entrance at Place de l'Opera it was replaced by a more classical entrance. Beginning in 1912, all the Guimard metro entrances were replaced with functional entrances without decoration. From the 1870s until the 1930s the most prominent style for Paris churches was the Romano-Byzantine style; the model and most famous example was the Sacré-Cœur, by Paul Abadie, whose design won a national exposition. Its construction lasted the entire span of the Belle Epoque, between 1874 and 1913, under three different architects; it was not consecrated until 1919. It was modeled after the romanesque and Byzantine cathedrals of the early Middle Ages, which Abadie had restored. The style also appeared in the church of Notre-Dame d'Auteuil by Émile Vaudremer (1878–92) The church of Saint-Dominque, by Leon Gaudibert, (1912–25) followed the style of Byzantine churches, with a massive central dome. The first church in Paris to be constructed of reinforced concrete was Saint-Jean-de-Montmartre, at 19 rue des Abbesses at the foot of Montmartre. The architect was Anatole de Baudot, a student of Viollet-le-Duc. The nature of the revolution was not evident, because Baudot faced the concrete with brick and ceramic tiles in a colorful Art nouveau style, with stained glass windows in the same style. Aristide Boucicaut launched the first modern department store in Paris Au Bon Marché, in 1852. Within twenty years, it had 1,825 employees and an income of more than 20 million francs. In 1869 Boucicault began constructing a much larger store, with an iron frame, a central courtyard covered with a glass skylight. The architect was Louis-Charles Boileau, with assistance from the engineering firm of Gustave Eiffel. After more enlargements and modifications, the building was finished in 1887, and became the prototype for other department stores in Paris and around the world. Au Bon Marché was followed by au Louvre in 1865; the Bazar de l'Hôtel de Ville) in 1866, Au Printemps in 1865; La Samaritaine in 1870, and Galeries Lafayette in 1895. All the new stores glass skylights whenever possible to fill the stores with natural light, and designed the balconies around the central courts to provide the maximum of light to each section. Between 1903 and 1907 the architect Frantz Jourdain created the interior and façades of the new building of La Samaritaine. The new office buildings of the Belle Époque often made use of steel, plate glass, elevators and other new architectural technologies, but they were hidden inside sober neoclassical stone façades, and the buildings matched the height of the other buildings on Haussmann's boulevards. The headquarters of the bank Crédit Lyonnais, built in 1883 on the boulevard des Italiens in 1883 by William Bouwens Van der Boijen, was in the Beaux-Arts style on the outside, but inside one of the most modern buildings of its time, using an iron frame and glass skylight to provide ample light to large hall where the title deeds were held. In 1907 the building was updated with a new entrance at 15 rue du Quatre-Septembre, designed by Victor Laloux, who also designed the Gare d'Orsay, now the Musée d'Orsay The new entrance featured a striking rotunda with a glass dome over a floor of glass bricks, which allowed the daylight to illuminate the level below, and the three other levels below. The entrance was badly damaged by a fire in 1996; the rotunda was restored, but the only a few elements still remain of the titles hall. Private houses and apartment buildings in the Belle Époque were usually in the Beaux-Arts style, either neo-Renaissanace or neoclassical, or a mixture of the two. A good example is the Hôtel de Choudens (1901) by Charles Girault, built for a client who wanted a house in the style of the Petit Palais, which Giraud had designed. Apartment buildings saw changes in the interiors; with the development of elevators, the apartment of the wealthiest residents moved from the first floor above the street to the top floor. The rooflines of the new apartment buildings also changed, as the city removed the restrictions –imposed by Haussmann; the most extravagant example was the apartment building at 2729 quai Anatole-France in 7th arrondissement (1906) which sprouted profusion of turrets, spires and decorative arches, made possible by reinforced concrete. A competition for new façades was held in 1898, and one winner was Hector Guimard for the design of a new apartment building, the Castel Béranger (1895–98]], the first Paris building in the Art Nouveau style. The façade was inspired by the work of the Belgian Art-Nouveau pioneer Victor Horta; it used both elements of medieval architecture and curved motifs inspired by plants and flowers. Horta designed every detail of the house, including furniture, wallpaper, door handles and locks. The success of the Castel Beranger led to Guimard's selection to design the entrance of stations of the new Paris Métro. In 1901 the façade competition was won more extravagant architect, Jules Lavirotte, who designed a house for the ceramic maker Alexandre Bigot which was more a work of inhabited sculpture than a building. The façade was entirely covered with decorative ceramic sculpture. The popularity of Art Nouveau did not last long; the last Paris building in the style was Guimard's own house, the Hôtel Guimard at 122 Avenue Mozart (1909–13). 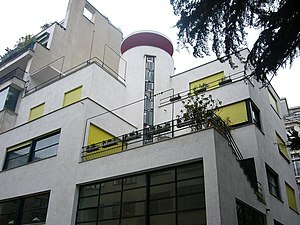 The leading proponents of the art deco were Auguste Perret and Henri Sauvage. Perret designed the Théâtre des Champs-Élysées, the first art deco building in Paris, in 1913, just before the War. His major achievements between the wars were the building of the Mobilier National (1936) and the Museum of Public Works (1939), now the Economic and Social Council, located on place d'Iéna, with its giant rotunda and columns inspired by ancient Egypt. Sauvage expanded the La Samaritaine department store in 1931, preserving elements of the Art-Nouveau interior and façades, while giving it an art-deco form. He experimented with new, simpler forms of apartment buildings, including the stepped building, creating terraces for the upper floors; and covered concrete surfaces with white ceramic tile, resembling stone. He also was a pioneer in the use of prefabricated building materials, reducing costs and construction time. A related Paris fashion between the wars was the pacquebot style, buildings that resembled the ocean liners of the period, with sleek white façades, rounded corners, white façades, and nautical railings. They often were built on narrow pieces of land, or on corners. One example is the building at 3 boulevard Victor in the 15th arrondissement, built in 1935. The international expositions of the 1920s and 1930s left fewer architectural landmarks than the earlier exhibitions. 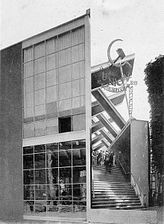 The 1925 Exposition of decorative arts had several very modern buildings, the Russian pavilions, the art deco Pavillon du Collectionneur by Ruhlmann and the Pavillon d'Esprit by Le Corbusier, but they were all torn down when the exhibit ended. One impressive art deco building from the 1934 Colonial Exposition survived; the Museum of the Colonies at la Port Doréé, by Albert Laprade, 89 meters long, with a colonnade and a front wall entirely covered with a bas-relief by Alfred Janniot on the animals, plants, and cultures the theme the cultures of the French colonies. The interior was filled with sculpture and murals from the period, still visible today. Today the building is the Cité nationale de l'histoire de l'immigration, or museum of the history of immigration. Modernist buildings built in the 1920s and 1930s were relatively rare. The most characteristic Paris residential architect of the 1920s was Michel Roux-Spitz, who built a series of large luxury apartment buildings in the 1920s and 1930s, mostly in the 6th and 7th arrondissements. The buildings were all built of reinforced concrete, and featured and had white walls, often faced with stone, and horizontal rows of three-faced bow windows, a modernized version of the Haussmann apartment buildings on the same streets. Church of Saint-Esprit, 186 avenue Daumesnil (12th arr.) by Paul Tournon (1928–32), has modern exterior and massive reinforced concrete Byzantine dome. The Grand Mosque of Paris (1920–24) built to honor the Muslim soldiers who died fighting for France in World War I. Several new churches were built in Paris between the wars, in varied styles. The Église du Saint-Esprit, (1928–32), designed by Paul Tournon, located at 186 Avenue Daumesnil in the 12th arrondissement, designed by Paul Tournon. has a modern exterior, made of reinforced concrete covered with red brick and modern bell tower 75 meters high, but the central feature is a huge dome, 22 meters in diameter, The design, like that of the Basilica of Sacré-Cœur, was inspired by Byzantine churches. The interior was decorated with murals by several notable artists, including Maurice Denis. The Église Saint-Pierre-de-Chaillot, at 31 avenue Marceau (16th), was designed by Émile Bois (1932–38). Its tower and massive Romanesque entrance was inspired by the churches of the Périgord region. The Church of Sainte-Odile at 2 Avenue Stephane-Mallarmé (17th arrondissement), by Jacques Barges (1935–39) has a single nave, three neo-Byzantine cupolas, and the highest bell tower in Paris. In the years after World War II, modernism became the official style for public buildings, both because it was new and fashionable, and partly because it was usually less expensive to build. Buildings were designed to express their function, using simple geometric forms, with a minimum of ornament and decoration. They were usually designed so that every office had its own window and view. The materials of choice were reinforced concrete, sometimes covered with aluminum panels, and glass. The term "Palais" used for many public buildings before the war was replaced by the more modest term "Maison", or "House." In place of decoration, the buildings often contained works of sculpture in interior courtyards and were surrounded by gardens. There was little if anything specifically French about the new buildings; they resembled modernist buildings in the United States and other parts of Europe, and, particularly under President Mitterrand, were often designed by internationally famous architects from other countries. Two of the projects of residential towers were especially large; 29 hectares along the banks of the Seine at Beaugrenelle, and 87 hectares between Place de l'Italie and Tolbiac. Blocks of old buildings were torn town and replaced with residential towers. Between 1959 and 1968, the old Montparnasse railway station was demolished and rebuilt nearby, making a large parcel of land available for construction. The municipal council learned of the project only indirectly, through a message from the ministry in charge of construction projects. The first plan, proposed in 1957, was a new headquarters for Air France, a state-owned enterprise, in a tower 150 meters high. In 1959, the proposed height was increased to 170 meters. In 1965, to protect the views in the historic part of the city, the municipal council declared that the new building should be shorter, so it would not visible from the esplanade of Les Invalides. In 1967, the Prefect of Paris, representing the government of President de Gaulle, overruled the municipal council decision, raised the height to two hundred meters, to create more rentable office space. The new building, built between 1969 and 1972, was (and still is) the tallest building within the city limits. The growing number of skyscrapers appearing on the Paris skyline provoked resistance from the Paris population. In 1975, President Giscard d'Estaing declared a moratorium on new towers within the city, and in 1977 the City of Paris was given a new Plan d'Occupation des Sols (POS) or Land use plan, which imposed a height limit of twenty-five meters in the center of Paris and 31 meters in the outer arrondissements. Also, new buildings are required to be constructed right up to the sidewalk, without setbacks, further discouraging very tall buildings. The building of skyscrapers continued outside of Paris, particularly in the new business district of La Défense. At the end of the 20th century, the tallest structure in the City of Paris and the Île-de-France was still the Eiffel Tower in the 7th arrondissement, 324 meters high, completed in 1889. The tallest building in the Paris region was the Tour First, at 225 meters, located in La Défense built in 1974. After the War Paris faced a severe housing shortage; most of the housing in the city dated to the 19th century, and was in terrible condition. Only two thousand new housing units were constructed between 1946 and 1950. The number rose to 4,230 in 1951 and more than 10,000 in 1956. The office of public housing of the City of Paris acquired the cheapest land it could buy, at the edges of the city. In 1961, when land within the city was exhausted, they were authorized to begin buying land in the surrounding suburbs. The first postwar social housing buildings were relatively low- three or four stories. Much larger buildings began to appear in the mid-1950s. They were built with prefabricated materials and placed in clusters. 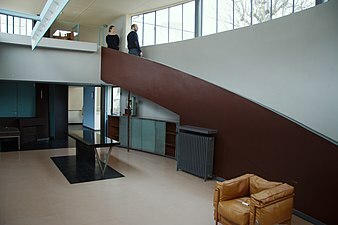 They were known as HLMs, or Habitations à loyer moderé, or moderate-cost housing. A larger type of HLM began to appear in the mid-1950s, known as a barre, because it was longer than it was high. The usually had between 200 and 300 apartments, were built in clusters, and were often some distance from shops and public transportation. They were welcomed by the families who lived there in the 1950s and early 1960s, but in later years they were crowded with recent immigrants and suffered from crime, drugs and social unrest. The American architect Frank Gehry also made a notable contribution to Paris architect, for his American Center in Bercy (1994), which became the home of the Cinémathèque Française in 2005; and for the building of the Louis Vuitton Foundation, a museum of modern and contemporary art in the Bois de Boulogne. A notable new style of French architecture, called Supermodernism by critic Hans Ibeling, gives precedence to the visual sensations, spatial and tactile, of the viewer looking at the façade. The best-known architects in this school are Jean Nouvel and Dominique Perrault. The Hôtel Berlier (1986–89) by Dominique Perrault, an office building at 26-34 rule Brunneseau in the 13th arrondissement, is a block of glass, whose structure is nearly invisible. Perrault also designed the new French National Library. The headquarters of the newspaper Le Monde at 74–84 boulevard August-Blanqui in the 13th arrondissement, designed by Christian de Portzamparc (2005), has a façade that resembles the front page of the newspaper. The administration building of the French Ministry of Culture at 182 rue Saint-Honoré (2002–04), by Francis Soler and Frédéric Druot, is an older structure whose façade is completely covered with an ornamental metal mesh. The Hôtel Fouquet's Barrière at 2 rue Vernet, 23 rue Quentin-Bauchart and 46 avenue George-V, in the 8th arrondissement, designed by Édouard François, is covered by a skin of concrete which is a molding of the façade of an historic neighboring building. One important theme of early-21st-century Paris architecture was making buildings that were ecologically friendly. The "Flower-Tower" built in 2004 by Édouard François, located at 23 rue-Albert-Roussel in the 17th arrondissement, is covered with the living foliage of bamboo plants, placed in concrete pots at the edges of the terraces on each floor, and watered automatically. The façade of the university restaurant building at 3 rue Mabillon in the 6th arrondissement, built in 1954, was recovered by architect Patrick Mauger with the logs of trees, to provide better thermal isolation. Another important theme in 21st-century Parisian architecture is the conversion of older industrial or commercial buildings for new purposes, called in French "reconversions" or "transcriptions". A large grain warehouse and flour mill in the 13th arrondissement were converted between 2002 and 2007 into buildings for the Paris Diderot University campus. The architects were Nicolas Michelin and Rudy Ricciotti. ^ a b Fierro 1997, pp. 11–12. ^ Texier 2004, pp. 8–9. ^ Texier 2012, pp. 10–11. ^ Delon 2000, pp. 6–8. ^ Delon 2000, pp. 12–37. ^ a b Texier 2012, pp. 12–13. ^ a b c Texier 2012, pp. 14–15. ^ a b Texier 2012, pp. 22–23. ^ Texier 2012, p. 26. ^ a b c Texier 2012, p. 24. ^ Texier 2012, pp. 26–27. ^ Texier 2012, pp. 24–25. ^ Texier 212, pp. 22–23. ^ Texier 2012, pp. 28–29. ^ Renault 2006, p. 48. ^ Texier 2012, pp. 38–39. ^ Texier 2102, pp. 36–37. ^ Texier 2012, pp. 40–41. ^ Texier 2012, pp. 30–31. ^ Texier 2012, pp. 44–45. ^ Renault 2006, p. 52. ^ Texier 2012, pp. 58–59. ^ Texier 2012, p. 60. ^ Texier 2012, pp. 52–53. ^ Texier 2012, pp. 54–55. ^ Antoine 1989, pp. 556–557. ^ Texier 2012, p. 66. ^ Daniel Roche (1987). The People of Paris: An Essay in Popular Culture in the 18th Century. U. of California Press. p. 10. Retrieved 2016-02-10. ^ Sarmant 2012, p. 133. ^ Louis-Sébastien Mercier (1817). Paris: Including a Description of the Principal Edifices and Curiosities of that Metropolis. p. 21. Retrieved 2016-02-10. ^ Letter from Voltaire to Caylus, extract published in A. Roserot (1902), cited by Rabreau, pg. 99.Translation by D.R Siefkin. ^ Texier 2012, pp. 66–67. ^ 2012 & Texier, pp. 68–69. ^ Texier 2012, p. 64. ^ Texier 2012, p. 98. ^ Héron de Villefosse 1958, p. 313. ^ Texier 2012, pp. 84–85. ^ Sarmant, 2012 & page163. ^ Fierro 2003, p. 36. ^ Texier 2012, pp. 70–71. ^ a b Texier 2012, pp. 74–75. ^ Renault 2006, p. 104. ^ a b Héron de Villefosse 1959, p. 325. ^ Texier 2012, pp. 76–77. ^ a b Fierro 1996, pp. 900–901. ^ Renault 2006, p. 101. ^ Texier 2012, p. 48. ^ Texier 2012, pp. 90=91. ^ Texier 2012, pp. 78–79. ^ Texier 2012, p. 108. ^ Texier 2012, pp. 118–119. ^ Texier 2012, pp. 86–87. ^ Texier 2012, p. 2012. ^ a b Sarmant 2012, p. 206. ^ Texier 2012, pp. 138–39. ^ a b Texier 2012, p. 128. ^ Texier 2012, p. 236. ^ Dumoulin, Aline, Églises de Paris (2010), Éditions Nassin, ISBN 978-2-7072-0683-1, pages 166–167. ^ Texier 2012, p. 129. ^ Lemoine 2000, p. 181. ^ Texier 2012, p. 156. ^ Lemoine 2000, p. 186. ^ Texier 2012, pp. 170–171. ^ Bezbakh 2004, pp. 799–815. ^ Texier 2012, p. 158. ^ a b Marchand 1993, p. 302. ^ Texier 2012, p. 164. ^ Texier 2012, pp. 152–153. ^ Poisson 2009, pp. 285–286. ^ Texier 2012, pp. 180–181. ^ Texier 2012, pp. 178–179. ^ Texier 2012, pp. 172–173. Antoine, Michel (1989). Louis XV. Fayard. ISBN 2-213-02277-1. Delon, Monique (2000). La Conciergerie. Éditions du Patrimoine. ISBN 978-2-85822-298-8.
de Finance, Laurence (2012). La Sainte-Chapelle. Éditions du Patrimoine. ISBN 978-2-7577-0246-8. Lemoine, Bertrand (2000). Guide d'architecture - France 20th century. Picard. Poisson, Michel (2009). 1000 Immeubles et monuments de Paris. Parigramme. ISBN 978-2-84096-539-8. Wikimedia Commons has media related to Buildings in Paris.